DEMBA BA: Has he given Jose something to think about? I am the first to hold my hands up and admit that I sat there on transfer deadline day and hoped that of the strikers we had, Demba Ba would seal what looked like move to Arsenal on loan for the season!. Now that's nothing personal against BA but looking at what we had at the time, I honestly believed that Torres, Lukaku and Samuel Eto'o are better options. We all know what happened as a result and Demba Ba remains a Chelsea player. Again, nothing personal here when I say this but to me he doesn't look like a Chelsea player. He proved himself at Newcastle and West Ham but referring back to comments made by Jose Mourinho of Lukaku at Everton, it's one thing to play for Newcastle another to play for Chelsea! So let me take you back to Sunday and an hour before kick off when the teams came through and I saw Ba was starting. To say I was surprised was an under statement based on the fact that it seems to have been between Eto'o and Torres for the regular start so far this season. If you look back to Mourinho's pre match comments to SKY he almost admits that because Ba has trained hard and remained professional, he deserves to have a chance. However, again I hold my hands up here and admit that Ba provided Chelsea and Jose Mourinho the alternative I had stated we seemed to have lost with the exit of Lukaku to Everton. We had a focal point to our attack in Demba Ba. He could bring other people into play with our first goal being a perfect example. He makes the run in behind and we play the long ball over the top. He controls it, and lays it off to Oscar who has made a run to push up and support him. Again, another run in between two defenders similar to that of Didier Drogba at Stamford Bridge two seasons ago against Valencia at the Bridge and the same player Juan Mata plays a slide rule pass into Ba as he has split the two defenders. Unfortunately for Ba on this occasion the keeper saves! Another long ball up to Ba puts the Goalkeeper under pressure and Ba is denied by the reaction of the Goalkeeper to the second ball to deny him a goal. Once more the ball is played up to him and the Goalkeeper comes out and cannot deal with the Ba under pressure from Ba and his turn and shot is mopped up by the defender covering in behind. 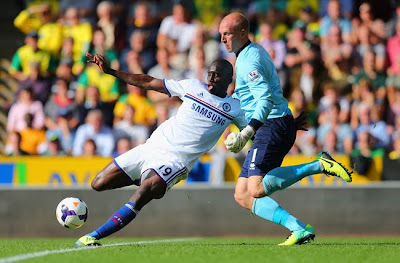 In those four instances, Demba Ba gave us an example of the variation we have in our game with him in the side. We do not have to rely on quick, short passes to feet wide or in between the lines. Four balls over the top created all sorts of havoc in their back four and they found it difficult to deal with. Has Demba Ba given Jose Mourinho food for thought during this international break?